It’s good to be back! I had a terrific time in Iowa visiting family over Thanksgiving. My wife and I were at Kinnick Stadium on Friday, and the season really came full circle for me. I was in Chicago at Soldier Field when the 2012 Hawkeyes kicked off the season with a victory over Northern Illinois, and I watched them suffer a tough loss against Nebraska to end the year. It was a frustrating season, obviously. The game against Nebraska was there for the taking…14 points would have gotten the job done. Just two touchdowns! But just like the game against Ames, the offense was pitiful, and the result was another aggravating defeat. If Iowa wants to have a rivalry with Nebraska, they need to win a few games against them…not every meeting or even half of them, but their fair share. This contest was very winnable, yet the Hawks dropped a close game (by less than a touchdown) for the fifth time in 2012. Despite the loss, I think Iowa playing Nebraska on the Friday after Thanksgiving is a wonderful new tradition in Hawkeye football history. I mentioned in my last post that this past game with Nebraska was the first Friday game ever played at Kinnick Stadium. Friday football after Thanksgiving is a Nebraska tradition that Iowa is now a part of, and I think that’s a tremendous thing for the Hawks. Hawkeye football and Thanksgiving have been a pair all the way back to the very beginning of the Iowa program. Many fans know that Iowa’s first intercollegiate football game took place in Grinnell when the Hawkeyes played and lost to what is now known as Grinnell College in 1889. What some fans may not know is that the Hawks were scheduled to play Grinnell in a rematch that year in Iowa City…on Thanksgiving. This rematch was cancelled on account of severe weather, but Hawkeye football would become a staple of Iowa Thanksgivings for years to come. Iowa’s first Thanksgiving game took place the following year, and it resulted in the program’s first victory ever. The Hawks defeated Iowa Wesleyan, 91-0, on Thanksgiving Day, 1890. Iowa spent their next eight Thanksgivings squaring off on the gridiron against the Nebraska Cornhuskers, maintaining a heated rivalry with the border school throughout the 1890s. The Hawkeyes played on every Thanksgiving Day from 1890-1906 before abandoning the tradition after 17 years. The Big Ten limited member schools to just five football games in 1907, and with the shortened season, Iowa ended their season before Turkey Day that year. Thanksgiving football left the Hawkeye program, never to return. 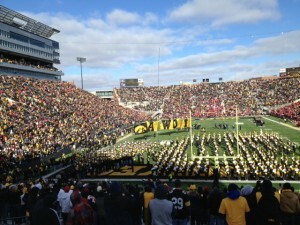 Thanksgiving and the day after were off limits for Iowa football for over a century until 2011 and the renewal of the annual Iowa-Nebraska series. I was able to see the Friday series brought to Kinnick Stadium for the first time last weekend, and I think it’s a fabulous event for the Hawkeye program. Boy, Iowa just can’t seem to top Virginia Tech in the Big Ten/ACC Challenge. I thought maybe the third time would be the charm for the Hawks, but no such luck. VT has only three victories in the Big Ten/ACC Challenge…and all are over Iowa! The difference in the game was the Hokies’ Erick Green. His senior leadership really magnified the youth of this Hawkeye squad. Green’s play plus the Tech home court helped Virginia Tech go on a 10-1 run at the end of the first half, and it was a hole from which Iowa just couldn’t recover. The Hawks kept fighting (I enjoyed the May steal, May getting the ball stolen, and the Clemmons steal all in the span of about three seconds), but Iowa missed an opportunity to sneak away with a solid road win. Iowa’s record in this Big Ten/ACC Challenge is pretty abysmal. I know that the bragging rights associated with this pre-conference “challenge” is more or less meaningless, but it would be nice if the Hawks could chip in soon and help the Big Ten out in this thing. ESPN is celebrating Jimmy V Cancer Research week this week, and they gave a nice update during the Iowa-Virginia Tech game on Gary Dolphin’s cancer battle. Great to hear he’s doing well, and best wishes to him going forward. Positive reviews continue to roll in for my latest book on Duke Slater. I recently did an interview with Pat Williams, an amazing guy down in Orlando. The interview will air on his radio show, Inside the Game with Pat Williams, on December 16 on WORL-AM 660. The audio should air then at the attached link, but I’ll have more information as the date approaches. Congratulations to the Hawkeye women’s basketball team on their upset of #12 West Virginia last week. Special congrats to Jamie Printy, who is proving to be quite a sharpshooter, making all 17 of her attempts from the free throw line. I also haven’t had a moment to pass along congratulations to Rutgers University on becoming the 14th member of the Big Ten. I think they’ll be a great addition to the league, and maybe this will give me an excuse to head up to NYC sometime for a game! Along those lines, there is a lot of speculation on where conference realignment is headed and what it means for the Big Ten. In my next post, I’ll give you my thoughts on the Big Ten’s next move and tell you, if I were in Jim Delany’s shoes, which school I’d target to receive the next invitation to join the conference. And I guarantee that my suggestion will surprise you.